by Dave from The Longest Way Home ~ July 4th, 2011. Updated on November 1st, 2016. Published in: Travel blog » Thailand. Pickpockets and scams: is it Bangkok, or are some tourists just asking for it? Has tourism changed in the past few years? Or have people gotten lazier? Or have tourist touts just been breeding and evolving more? Tourists with giant maps, cameras, and lost looks make for easy sources of legitimate and illegitimate cash. If you’ve never been to Thailand, you might be shocked to see so many tourists traveling with expensive cameras hanging loosely from their shoulders. Open bags. Passports in their back pockets. And, all manner of near on incomprehensible acts of “make me a target”. Yet, it’s only when they lose their precious possessions that many tourists scratch their head and wonder why did it happen to them? Downtown Bangkok is filled with traffic and pedestrians. I was in search of an office to drop a message off when I noted a man up ahead. He was talking to a stranger, lots of arms waving. Then it was over. I walked by, only to have him stagger backwards into me. At the same time I noticed a woman suddenly appear behind me. Instinctively I pushed the man forward and out of the way. Right choice. The typical double pickpocket distraction was in play. What dimwit asks for help after just getting shoved by an irate tourist? I swung around and pointed a finger at the woman coming in close from behind. My instincts were right, she swung abruptly around and slipped down a narrow side street while spitefully saying something I couldn’t make out. The man disappeared across the road at the same time as I backed myself up against a parked bike. People stared at me after my shout. But, all kept walking. Some people might be shocked at my reaction and language in this scenario. But, based on my experience, it’s better to become a king of calculated aggression under these circumstances. Than be just another victim. It has saved me before. This was in broad-daylight on a crowded street. These people don’t want attention drawn to them. My harsh reaction was to send them scattering. No more. At a different time of day or night, on a different street, I might have chosen a different reaction. Bottom line: it worked. Again, really not taking to Bangkok. I backtracked. If anything to see if this pair really were up to no good, or was I too paranoid? Sure enough the man was waiting around again. Two young tourist girls walked by as he tried to wave them down to stop and talk. They ignored him. A few minutes later and he was waving at another tourist. Pickpocket at work in Bangkok – distraction is the key! This time the tourist actually walked over to the man. There were a lot of similes and cheers. And, distracting hand waving by the Thai. The tourist nodded and pointed too. Then, that same woman appeared again. The tourist was in prime line of sight for her. Saved at the last minute by his girlfriend who pulled at him to enter a tuk tuk with a group of friends. The lady stopped, turned, and walked back. A minute or so later and the pickpocket team left the scene from opposite sides of the road. Hopping off the skytrain with no problems I made my way to Phraya river. My destination was meant to be the boat stop nearest to the Royal Palace. There was a long series of boats docked up along the concrete riverside. Surely this would be easy? It did take a little while of standing back and watching people before I found what looked like a regular river boat. In the queue a British tourist couple were not so happy. Seems like they’d paid a lot of money for a tour, rather than a regular boat trip up the river. They’d bought the tickets from some tout on near Khao San Road who told them it was an all day pass. Turned out to be a tour. They drowned their sorrows in some cans of beer they were carrying. Passing a heap of food stalls I was out in front of the Royal Palace walls. A short walk up and I saw a queue. Huge. I also noted the amount of tourists wearing shorts (you need to wear long pants only to get in). Was it this relaxed? Walking around the outer wall I walked passed the queue. Then passed another door and another. So, there was only one way in. At least I knew that now. A car pulled up and group of Americans got out near me. No sooner than they had when three local men came over and told us all that the ticket office was further up the street on. More pickpockets? Or just con-men? I looked at one guy, and frowned. But without questioning anyone the tourists followed the three men. Nearly immediately another car pulled up and the same thing happened all over again. Private tour cars it looked like. I walked back as a taxi pulled up. Again the couple inside were pounced on by one of the “ticket” men. Only now, the taxi man waved him off and pointed the tourists back to the main gate. 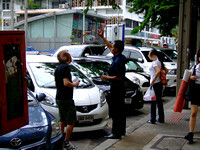 A genuine taxi man in Bangkok helping tourists?! Yes, it does seem to happen. A typical scam was in work outside the Royal Palace. What’s worse were that the people were falling for it. Moreover, no one at the royal palace seemed to care. The tourists were more than likely buying real tickets but with an added price attached. BTW the real entrance to the Grand Palace is on Wiset Chaisri Gate from 08.30-16.30 hrs. I don’t blame the touts or pickpockets. They see vulnerable tourists and go for it. Much like in any big city. The difference here is that Thais haven’t lost their human touch. Unlike in many western countries whereby it’s a near on offence to even say hello to a stranger on the street these days. The result. Thais are very happy at being … well, Thai! And me, well, to be honest it’s rubbing off a little on me. And, even when faced with pressures, scams and everything else; I’m smiling more these days too. Yesterday Thais voted in a national election. During the morning I walked around the city, hopping on and off that day’s free MRT (rail) service. A few big TV screens were showing polling booths on the news. People sat around and looked up. An old man turned as I sat down. I pointed to the screen, smiled, and gave him a thumbs up. He nodded and smiled back widely. Proud to be Thai, through and through. I don’t know why people can’t say hello, but can believe the first person they meet out of a taxi! Have you ever thought about writing something about how to avoid scams? I think many people go on holiday and want to forget about people just like them. 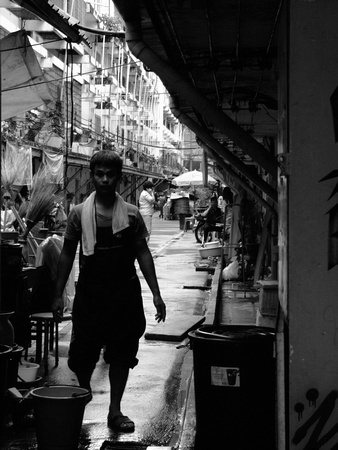 Then they arrive in a place like Bangkok and find the whole place filled with mirror images of themselves! Not sure about the guide Anna, if enough people ask, I certainly will! In some ways I blame the tourists for not doing their homework. A known scam in Bangkok is to tell tourists the Royal Palace is closed that day and then offer to take them on a “free” tour. If you read a guidebook or just about any online forum you’ll hear about it. Yet it continues to happen because people don’t take the time to learn about where they are going before they get there. The same goes for the river boat tickets. Read a guidebook. Would you buy tickets for a local bus from a tout? Seriously. Pickpockets are a problem in ANY large city and tourists need to be aware all the time. However, I’m shocked you had the presence of mind to push them off in that moment. I’m not sure I would. I’m going to Naples Italy in the fall and that city has a horrible petty crime reputation. Will it keep me from going? No. But you better bet I’ll be reading up on the latest scams before I go. I hear you! Research goes a long way to making a trip better. So says the guy who goes overboard. I remember going over and over the Iran to Pakistan route and all the tricks they get up to. Some of which can cost you your life. I went a bit paranoid. But in the end, it was worth it as things did go belly up. I’ve been a follower for a while but (I think) this is the first time I write a comment. First of all, let me say I really enjoy your posts because you take so much care in how they look – you’re layout is beautiful and so are your photos. About the topic of today’s post – yes, you are right. I think many tourists are sort of spaced out while travelling. They end up being scammed and then go back with a bad taste in their mouth. Also, as you said, for every scammer there are tens of well-meaning locals. I also do understand that if I earned 100 or less dollars per month roaming the streets as a taxi driver or tour operator for hours and hours and then saw all these ‘rich’ westerners (by comparison, of course) flocking over to my country keen on spending money, I’d probably be tempted to overcharge etc. Seriously, who wouldn’t? Thanks for the kind words, glad you like what I do here. Yep, you hit the nail on the head with those scammers. They see rich westerners, and go for it. I can’t blame them either. I can only make myself aware of them. It happens in top corporations too, mergers etc, but they seem untouchable! have you ever been bad tourist?may be at the start of your travel? I wouldn’t say “bad” tourist. Stupid, yes. One learns from ones mistakes and makes sure not to repeat them. I think there’s a very early blog post about getting followed by a gang in Spain. Again, since then, I’m very wary of people following me in big cities. While I agree that some tourists are asking for it and that so long as you keep your wits about you then you should be ok, it still doesn’t make the crimes any more acceptable. I have yet to be personally ripped off in Thailand (Apart from selling a camera for a very cheap price in MBK!) but I was still gassed to sleep in a bus (A classic, but it’s still happening, this was in April!) and a few of the other travellers had money stolen. All of our rucksacks were rummaged through too and it isn’t the best feeling in the world I can tell you that much! I love the Thais and I love Thailand, and I accept that it is a country where money is harder to come by than it might be for the travellers visiting. Such is life, I guess! Hostels are notorious for backpacks being rummaged through. Half the problem is that I see people moving around with cameras/ipods/phones/laptops/wallets in plain sight. Moreover, I’ve had reports of most thievery in hotels/hostels coming from other travelers rather than locals. And, it’s been that way for years. Shame, but kinda makes sense too. As you say, such is life! Good for you in reading up on the scams before going. I hope nothing bad happened and you had a great time. Looks like we missed each other by a week?! Ha ha. Yes, that sounds pretty typical alright. I can just imagine the tuk tuk driver pointing down at his sticker and the other guy waving him off. The world is full of scam artists. The worst are the “officials” that encounter at borders etc. Because there, you can’t do much. And, no one else “official” will believe you. I had my share of scam experience on my first trip to Thailand many years ago. I’ve been back many times since but I no longer have any encounters with them. When you visit Thailand the first time, everyone seems so gentle and smiling,the weather is hot, the sun is shining, you’re on vacation exploring an exciting and exotic place…. It makes you feel good about the world and the people in it. You’re willing to believe that the world is a good and decent place and so you relax your guard. Well it is – sometimes… But Thailand is just like anywhere else. It has both good and bad people. 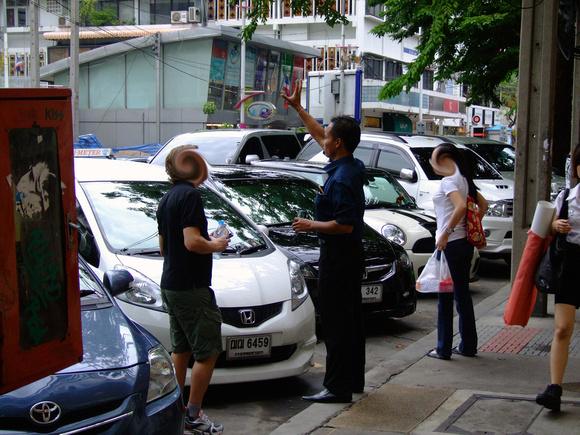 The common factor in these scams is how they happen around tourist locations and that it’s Thai people speaking good English approaching Western tourists. Thais don’t usually talk to people as readily as that. Think about it: would you stand around near tourist sights back home telling people they were closed and hailing them a taxi – unless you were up to something? Exactly the same here. Remember this fact and you’ll be fine. Also once you get out of the tourist areas of Bangkok the scamming and hassle vanishes. 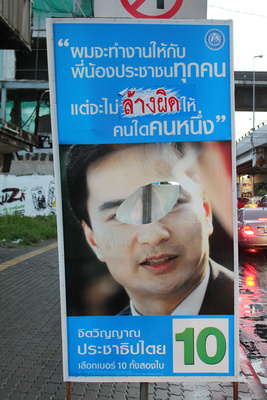 As for the tuc-tuc the white sticker – he was right, it denotes a “special” tuc-tuc: a scam one! I love the one where you walk to the Grand Palace and someone asks you where you are going. Then they tell you the Grand Palace is closed due to some Buddhist holiday then try and sell you some ticket to another place. You walk past them and the Grand Palace is open as it is almost every day of the year. Nice move with the pick pockets. They fooled with the wrong traveler. Isn’t just amazing how many touts hang around out side the grand palace and no one does anything about them?! Couldn’t help but turn the tables on those pickpockets, no mercy! Also check out the excellent (if a bit depressing) BangkokScams.com, with all the info you’ll need to avoid them. Thanks for that link. Interesting scams at work all over the city I see. Very true about people hanging around corners just to talk to you … sometimes tourists are just taken in my the smiles from reception etc and then bring the same safety net on to the streets. And so it will continue on in the big city “game”. I’ve not been in that part of the world, but can tell you scamming tourists is a “global” practice. Wherever there are tourists, scammers and pickpockets are not far behind. And as you said, it is for travellers to research their destinations. Sometimes, I don’t know whether I should be sorry for the tourists scammed by card tricksters in London, Paris or New York or justify it as a tax on stupidity. True, it happens all over the world. Nice quote about it being a “tax on stupidity”! Made me laugh. Reading this has sort of put me off going back to Bangkok Dave. I think your opening line sort of sums it up in my eyes. Not so long ago, traveling to a far way land was something for the truly adventurous soles. The daily work of a pick pocket or scam artist in Bangkok must be quite easy these days. In years gone by that had fewer targets and had to work a little harder for there steal. I suppose nothing stays the same forever, but I don’t like where it’s all going. Especially when I get off a plane and have to work so bloody hard to keep these rats at bay, because of all the stupid mistakes those dumb tourists have made over the years. I don’t dislike Bangkok is what I am concluding on. I simply don’t have much of a feeling towards it one way or another. Horror of horrors the other day as I was leaving. I spotted several giant double decker tour buses. Both outfitted with bright neon lights (purple & green), and filled with 20 something backpackers. I don’t think I even want to call them backpackers, they don’t look like travelers. More like white kids in shorts, tshirts, and carrying backpacks. Inside they were all stretched out, feet on chairs, beers in hand. I’ve seen hop on hop off buses before, but this was the ultimate. 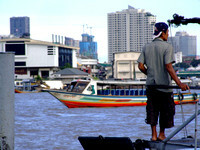 With this type of “tour travel” it’s no one wonder Bangkok’s got a several people wanting to taking advantage. For the rest of us, I think we are safe. I think you were really sharp to notice that double pickpocket episode you were undergoing., Dave. You know a lot about travel that other people don’t, I’m sure, because you’ve been doing it for so unbelievably long. There’s been a couple times in my life where I’ve had two people suddenly appear right on top of me, asking stupid questions and stuff. I think they were trying to distract me so they could do some harm. Neither time did I get robbed or anything, though, so maybe I was imagining it. These occurrences were in the U.S., by the way, not overseas. Just because you’re home doesn’t mean you’re safe. I’m not a that experience traveller, or just got lucky so far. So far I was careful in terms of wearing long shorts only, having my most important stuff in my pockets there. More difficult with the camera though. Maybe Malaysia wasn’t that dangerous in these aspects, while in Indonesia it might have been another story. Guess there they were more into talking you into expensive tours – got fooled more than once, yes – than stealing. I almost was victim to the boat scam. A kind gentleman told me that the boat taxis weren’t running because it was a holiday. I naively believed him and got in a tuk tuk to go to where boats are running. Turns out, that boat was going to cost me $30 a give me a tour I did not want. I cursed out the tuk tuk driver, then walked maybe 10 minutes to where the boat taxis are and of course, they were running. Needless to say, the attempted scam only cost me an extra dollar and maybe an hour of my day. Great posts and I like your advice. This is my bad experience in Thailand, they ruine partially my holiday because i lose two days for this sapphires scam in Takfah shop, I hope to don’t lose also my money. I hope that I cal help other tourist like me to avoid this scam. Thank you so much for this article. I think more than anything else, watching out for scams in another country is one of the most important things to become educated upon when traveling. I know this because I was scammed in Venice, Italy (of all places) out of 200 euros. The scam was similar to what you described with the distraction technique and before I realized what was happening, my money was gone. And, the worst part was that I went back to try and get my money back and I realized they were doing it all day, taking money from many other tourists. Suffice to say, I never got my money back, but I did learn a big lesson. Thanks again for this vital information.